A great safety system makes this trampoline extremely durable. Also, there is net-mounted basketball hoop. Assembly is a bit complicated. 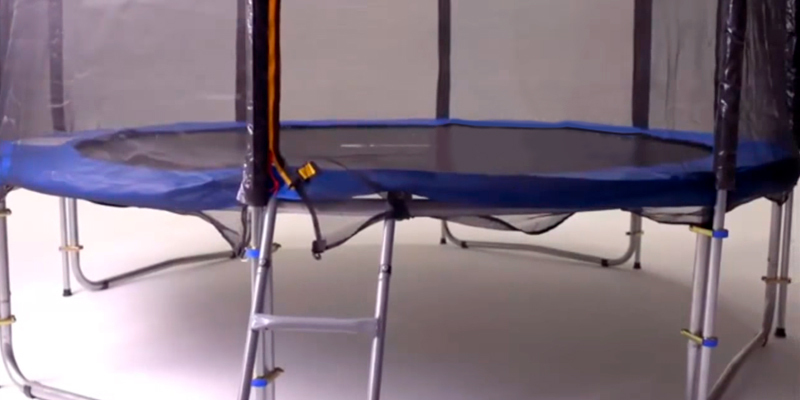 The Skywalker kids' trampoline ensures safe bouncing thanks to the unique security technology. Basketball hoop makes children joyful and at the same time develops their coordination. The unit is fitted with a ladder made of galvanized steel with non-skeed rugs on the crossbars. So, it is easy and safe to go up and down this high trampoline. The instructions are a bit poor. 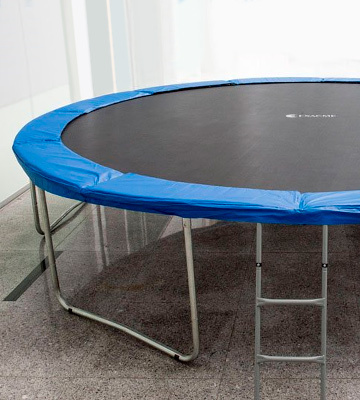 The Excame trampoline with the outer enclosure net is resistant to deformation and will survive everyday use, even if all your family members actively use it. The improved cushioning element ensures high jumps with no load on your joints. 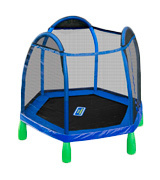 This Little Tikes 3' Trampoline is a high-quality and easy-to-move kids' trampoline at a reasonable price. 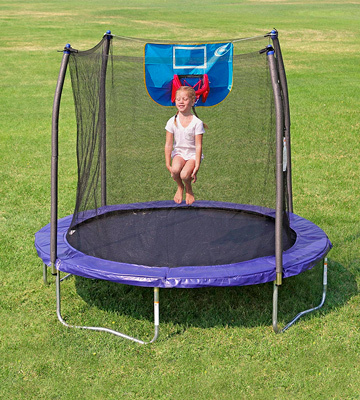 With this easy-to-move trampoline for kids, your child will be bouncing anytime he/she wants from a very young age. No doubt, your little one will be on cloud nine! 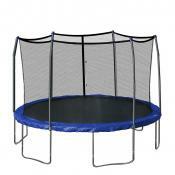 Bounce Pro My First Trampoline 84"
The enhanced safety is achieved by the concave arch poles. The jumping mat is manufactured from soft material. Can be used by one child at a time. 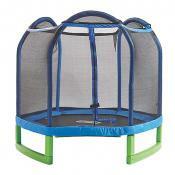 This multipurpose enclosed trampoline for toddlers will ensure that your kid has a lot of fun and delight. Let's mention that it's rather big and extremely reliable. 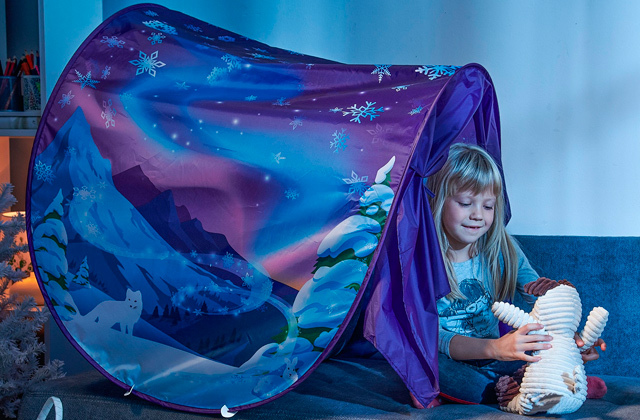 It can be placed in a corner of a room and the walls will prevent a kid from falling off. Also, with this trampoline, kids could learn the abc's. It has 4 corners, thus, it's not the safest option for very small kids. It's one of the best colorful and playful trampolines for toddlers. Additionally, this amazing unit helps children learn the alphabet. Durability is the perhaps the best word that describes this outdoor trampoline. The manufacturer has done its job perfectly to ensure the trampoline provides a high security level and holds to a vigorous use. The net of the model is made of a highly durable polyethylene which doesn't tend to tear and resists harmful UV radiation well. You can be sure this trampoline will survive several seasons at least without showing any signs of wear and tear. What is also great about this model is that its net is mounted not behind the springs but in front of them, making it safer for kids to jump in it. To get into the trampoline, there's a zippered entrance which should be fastened once a kid is inside. This way you can rest assured that your little monkey is enjoining themselves and you have no reason to worry about their safety. We should also mention a mat used at the bottom of the trampoline. 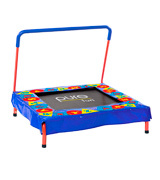 It's made of high-quality waterproof and non-slip material so your kids can not fall while jumping and hurt themselves. All the components of this model have been meticulously thought out to detail to provide every convenience and safety feature you'd expect from a high-quality trampoline for kids. So, if you're looking for a top-notch kids' trampoline that will serve you several years at least, the Jump N'Dunk trampoline is as good one as it gets. Perhaps the biggest advantage to buying this trampoline is that it's going to serve you for many years, providing fun and entertainment for all of your kids. Thus, if you have two or more children, this model is the best fit. Being 8 ft in diameter and of round shape, this trampoline is very accommodating. Besides, you can choose from other shapes. 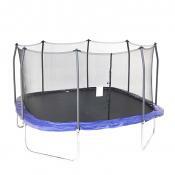 The manufacturer offers this trampoline in various modifications. 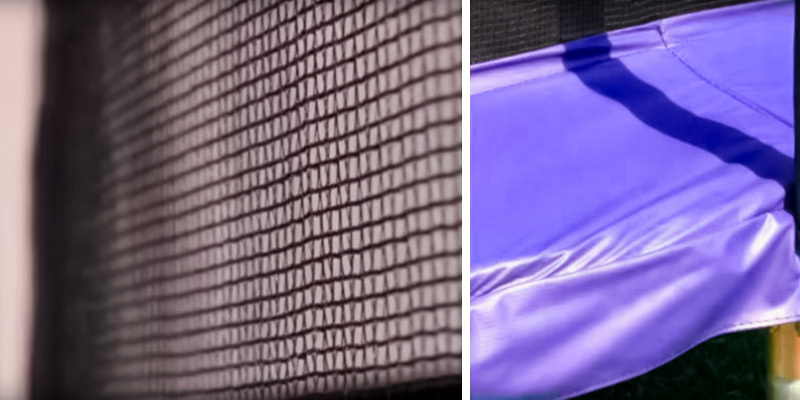 Not only is a net so durable, the frame of the construction is also great capable of withstanding up to 175 lbs. It's made of heavy-gauge galvanized steel and features T-sockets that reinforce and stabilize the construction when kids are bouncing inside. A nice bonus is this trampoline comes with a basketball hoop, so your child can not only jump on the trampoline but also play a bit and have some fun. 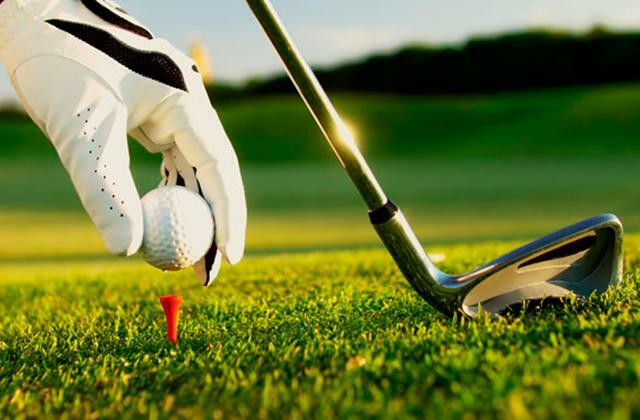 It’s also important to mention the cushioning which is achieved thanks to the heavy-gauge galvanized steel springs. 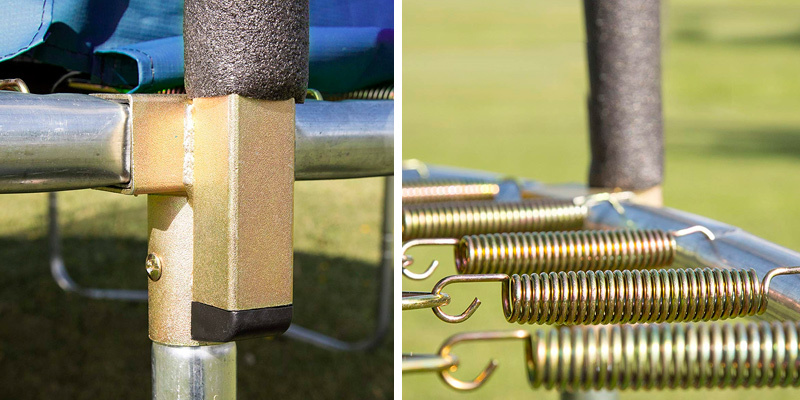 The stretching non-slip base of the trampoline is supported by 56 springs that ensure reliability and moderate hardness. To get the most out of this trampoline with a basketball hoop, you will obviously need a ball, if you still don't own one. Next, you might want to consider wind stakes that will ensure trampoline stability. There is even a set with a ladder if you need it. And finally, a tool for straining springs will provide safe frame attachment to the jumping mat. That's it, you're all set! If you're thinking about buying your child their first trampoline, you may want to consider the Exacme Combo Set Trampoline. Though slightly pricier than some other trampolines on the list, it comes with everything to provide your peace of mind and fun for your kids. 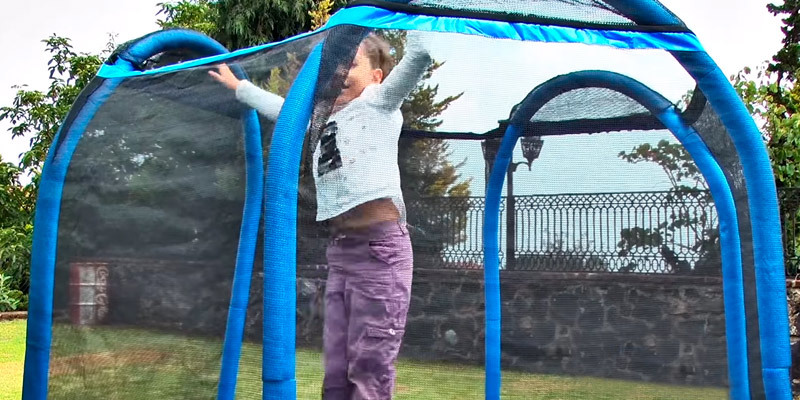 As expected, the Exacme Combo Set Trampoline comes with an enclosure net to ensure protection for your kid while he or she is jumping inside. It also has a zipper on the outer side, so you can fasten it and stand back watching how your kid is jumping and enjoying the time. A great addition to this model is a ladder. It's made of galvanized steel with non-skid rugs on the crossbars, which give it sturdiness and durability. Thanks to this ladder, even a small child will find it easy to climb up and down the trampoline. Also included are safety pads. Placed inside they block access to the springs making sure your kid cannot trip over them when bouncing on a trampoline. Still, the biggest proof of the high quality of this trampoline is that it's TUV certified. Not many trampolines have this certification, which gives the Exacme Combo Set Trampoline an edge over its counterparts. Safety aside, let's see what makes this trampoline special. 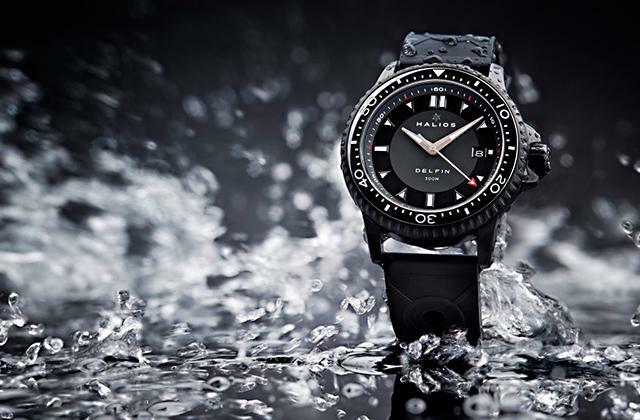 The model is claimed to be highly resistant to deformation and withstand active use. It features a robust construction and can hold up to 398 lbs of weight, which is nothing short of impressive. Plus, it has an improved cushioning element, which ensures high jumps while putting minimum load on your joints. All of this makes it equally suitable for kids (the recommended age is 6) and for adults. Next, the 6 W-shaped legs with non-skid patches make the construction very stable and ensure it securely stands on the ground. You can safely use it outdoors. 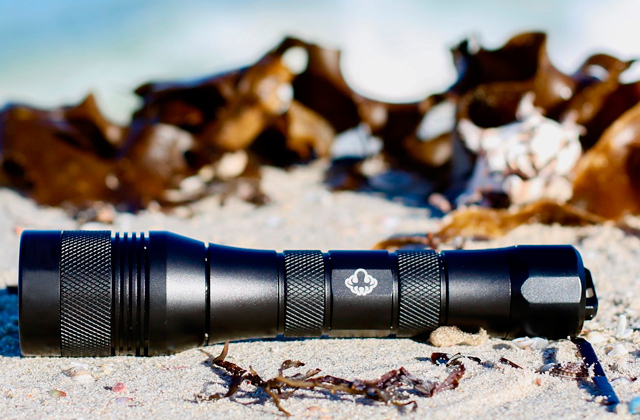 Moreover, the manufacturer says that the model is not susceptible to moisture and doesn't tend to fade in the sunlight quickly which means you don't need to store it away in the shed. The only negative about this model is that the assembly instructions that come in the set are not very clear and straightforward, which slightly spoils our impression. Still, given how many videos on YouTube are available for watching and the fact that the assembly is not complicated at all, we do not consider it a big issue. Now, the best thing about Excame trampolines is that they are offered in a whole range of sizes, allowing you to find the most suitable one for your kid. The rule here's as this: the bigger the size of the trampoline, the greater the number of springs it has. In conclusion, the Exacme Combo Set Trampoline is a high-quality trampoline for kids that features a reliable and sturdy construction, comes in a range of sizes, and has all safety features a kid's trampoline is supposed to have. If you're looking to buy a trampoline that will stand to test of time, we highly recommend this Exacme Combo Set. 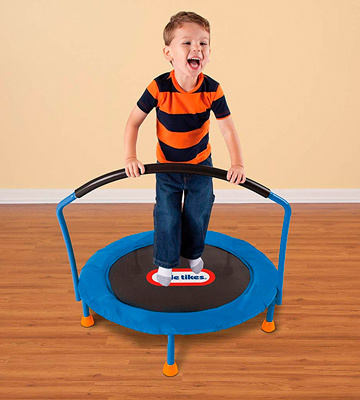 The Little Tikes trampoline is a little model that fits into any apartment and brings a lot of joy to the smallest members of your family. It isn't the type you'd buy for a child over 7 age because it's rather small with 3 ft diameter and 55 lb maximum weight capacity, but it's ideal for toddlers. 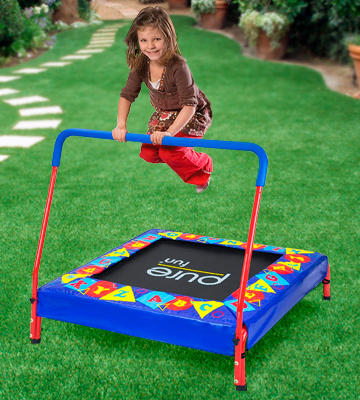 Fitted with a bar it provides safety and allows your little one to bounce on it without falling off. Not dissimilar to the other trampolines, this one has a mat too: it is placed over the springs to protect your kid from injuring themselves. Furthermore, the Little Tikes trampoline is very easy to put together. All you need to do is attach the legs and the handle to the mat using screws. This is easy to do and will take you no more than 15-20 minutes. 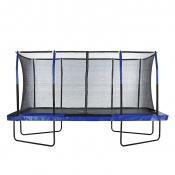 Though smaller than average, this trampoline is well built and sturdy. It's made of durable materials and provides extra stability. 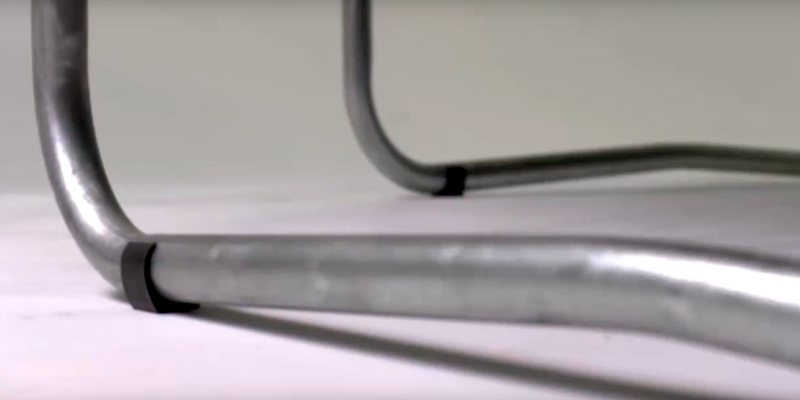 The metal frame has plastic legs so as not to accidentally scratch the flooring in your home. The balancing handle is made of metal with a plastic covering to provide your kid with a reliable grip. Undoubtedly, compactness is an obvious advantage of this trampoline, since this unit is very convenient for transportation. 20 elastic bands are used for cushioning. Besides, they reduce the weight of the trampoline and work as good as springs. 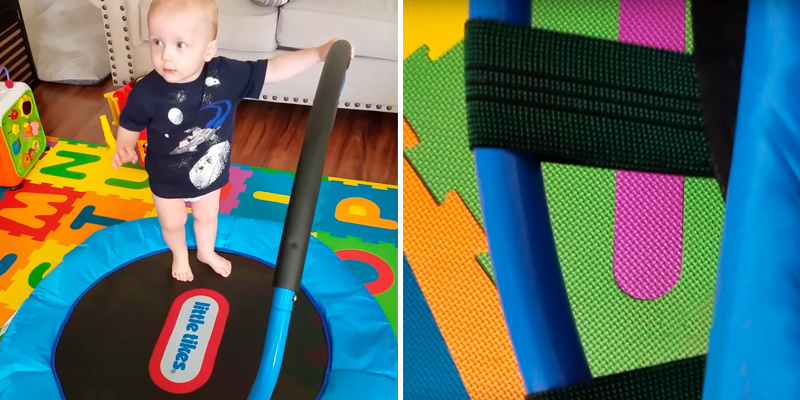 A small size and a large number of elastic bands make the jumping mat of this kid's trampoline pretty tense, which prevents too high jumping. 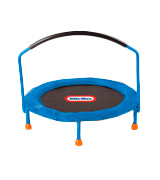 It's fair to say that this mini indoor trampoline for kids is ideal for those who are just learning to jump. 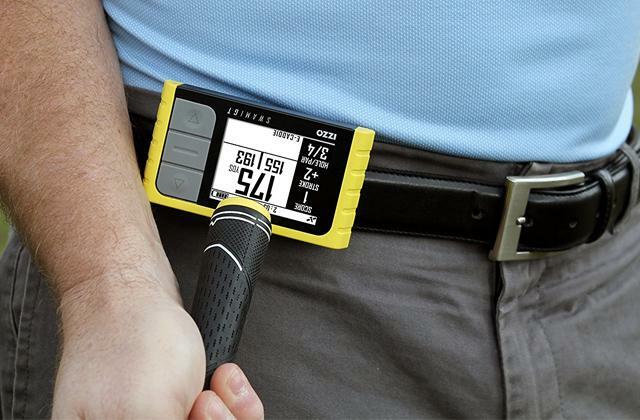 It's small, durable, secure and visually appealing. 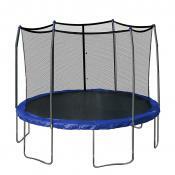 All these features make this little trampoline a nice present for the smallest kids. 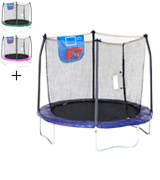 A lot of parents buy this indoor trampoline for their 2-3-year-old kids. The moment your child can balance, you can give him or her a little support and help jump. Doing this way, you'll teach your kid jumping and help coordination development. Don't hesitate to try it and enjoy watching how your little one starts jumping higher and higher. 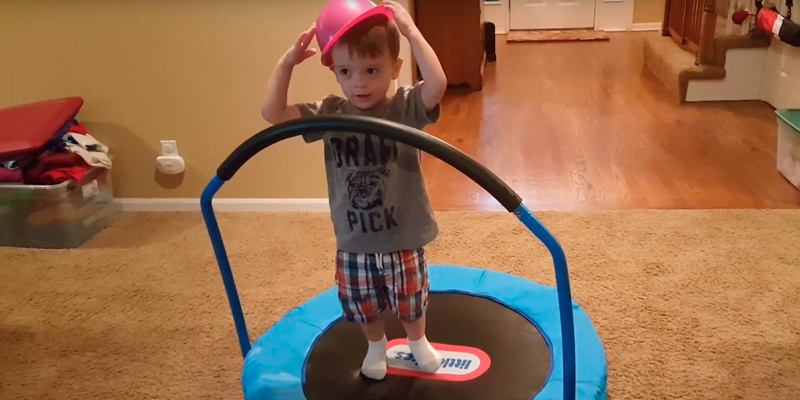 All in all, if you need a small trampoline for a toddler that is durable and easy to assemble, the Little Tikes Trampoline should be your top choice. Your child will be able to securely grip the bar and jump safely. Plus, this model won't cost you an arm and a leg. 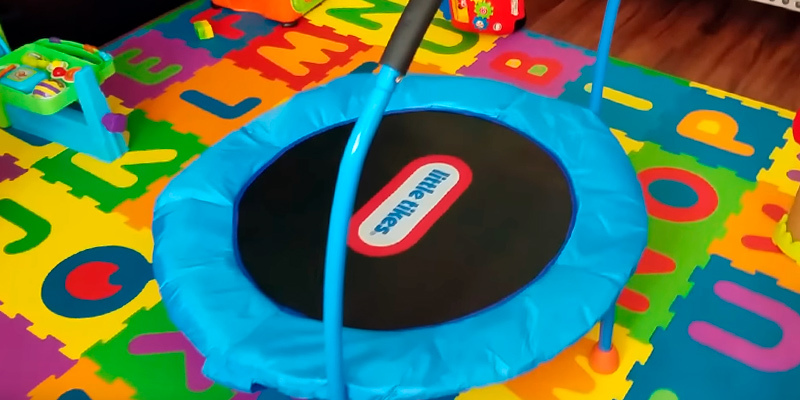 The Bounce Pro is a good trampoline for toddlers and older kids. This model comes in a decent size and bears quite a good load. 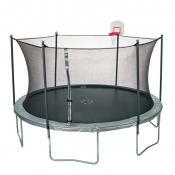 Like many other trampolines, it is completed with a jumping mat and safety net. But though the overall look is quite simple and doesn’t differ much from the other models, it has some aces up its sleeve. Our acquaintance with this trampoline by Bounce Pro has begun with the inspection of its safety. The kid's trampoline enclosure is made of a temperature drop resistant PE net and is supported by 3 strong steel arch poles. We consider the arches very safe since they don’t have any corners. And the high-quality zipper prevents your child from falling off while bouncing. The trampoline frame is manufactured from galvanized steel. In addition, there are 6 plastic legs for extra stability. Due to this strong design, this trampoline is appropriate for kids from 3 to 10 years old. Despite the manufacturer claims this trampoline ought to be used by one kid only, it's possible for several smaller children to play there at once. The maximum weight capacity is 100 lbs, that's what you shouldn't overlook, though. Amortization is provided by 36 durable steel springs, which, in our opinion, are more than enough for a trampoline of this size. The springs provide hard tension and will definitely serve for many years. The polypropylene jumping mat ensures flexibility and security too. Take note that this trampoline is suitable for both indoor and outdoor use. 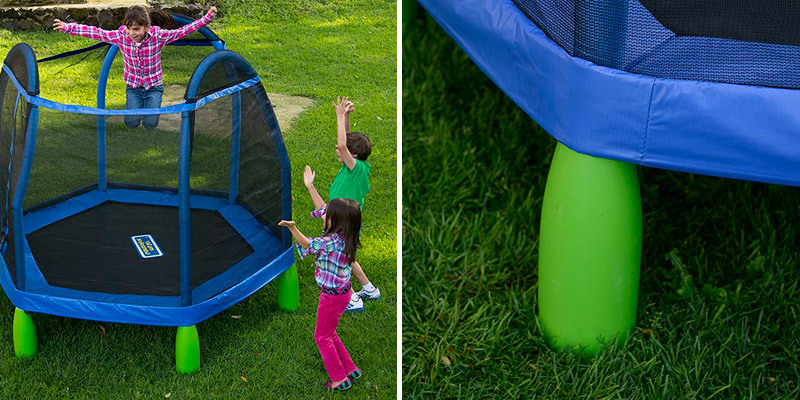 So, now your children can have fun bouncing anytime they want! 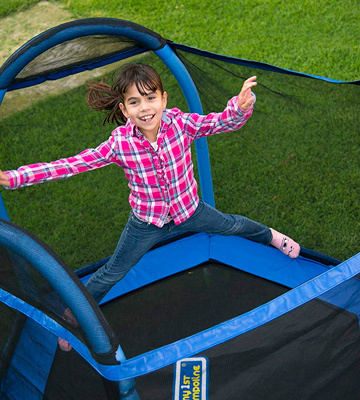 To conclude, the Bounce pro trampoline is a stoutly-built trampoline that will bring your child a ton of entertainment. It isn’t too small and can bear a decent load, so it can fit a few small kids at once (though it is a one-person trampoline according to the manufacturer). What is more, you can place it either in your house or in your garden, so your kid could have much fun both indoors and outdoors. 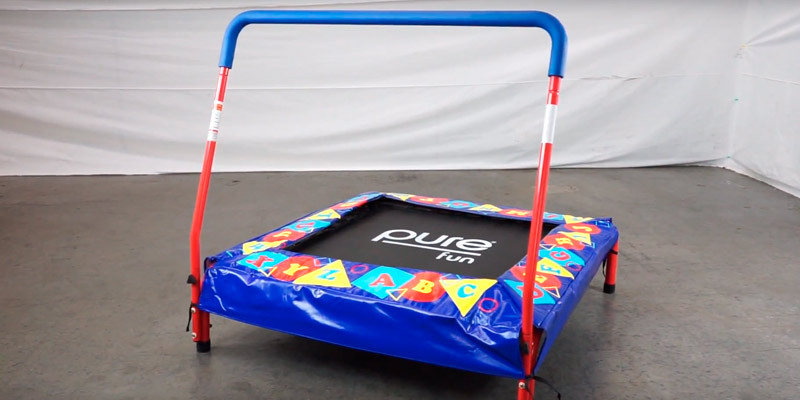 The Pure Fun Kids Preschool Jumper is one of the best trampolines for preschoolers. This model is not only small and compact but also has a bright, unique design. We dare no doubt in its safety properties since it is provided with a softly-padded handlebar with a non-slip grip. Besides, the handle is fixed to the corner of a square trampoline, thereby providing more space for jumping. 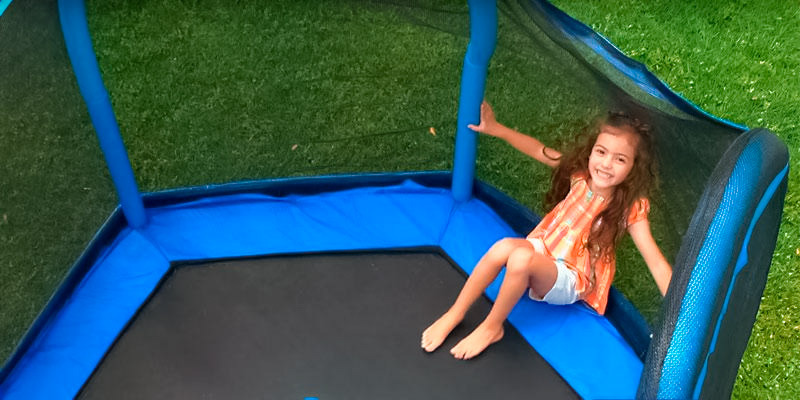 Designed with a non-slip jumping mat, this square trampoline is reasonably safe for use. The springs are hidden, so you can get it for your kid and be sure he or she won't ever get hurt. Yet, it's still recommended that your child uses a trampoline under your supervision. That's especially important for 3-year-olds and younger kids. The only thing we don’t really like about this product is that it has four corners. However, owing to the safety cover pad, they are not that sharp as might be expected. 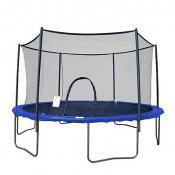 This trampoline from Pure Fun is suitable not only for entertainment but for studying as well. The safety pad features an alphabet written all around the trampoline. 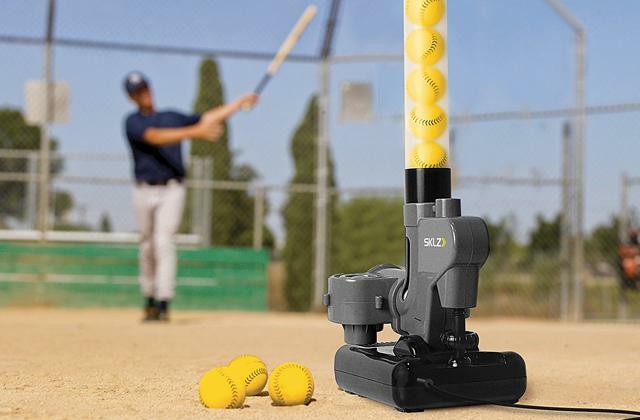 Thus, you can turn a jumping game into a fun lesson. In other words, your kids will be able to memorize the letters while having fun on a trampoline. No doubt they will enjoy such lessons much more than simply sitting and learning the alphabet by rote. If you're limited in space, you'll be pleased to know that this square trampoline by Pure Fun is a true space-saver. Due to its square design, it will easily fit any corner of a room. The frame is made of durable heavy-duty steel to withstand the weight load up to 75 lbs. This makes it suitable for use by kids between 3-7 years old. According to numerous tests, the Pure Fun trampoline has proven to deliver reliability and long service life. In short, if you want to bring more fun to your house and provide your kids with some extra entertainment, we highly recommend buying this model from Pure Fun. It doesn’t require much space and will help your kid learn the alphabet in a fun and easy way. We are almost sure that thanks to its attractive, visually-appealing design, your child will fall in love with it from the very first sight. What Is a Trampoline for Kids? All of us know how important it is for children to stay active. A kids' trampoline is a perfect option for this purpose. Children's trampolines are smaller and safer than sports ones. 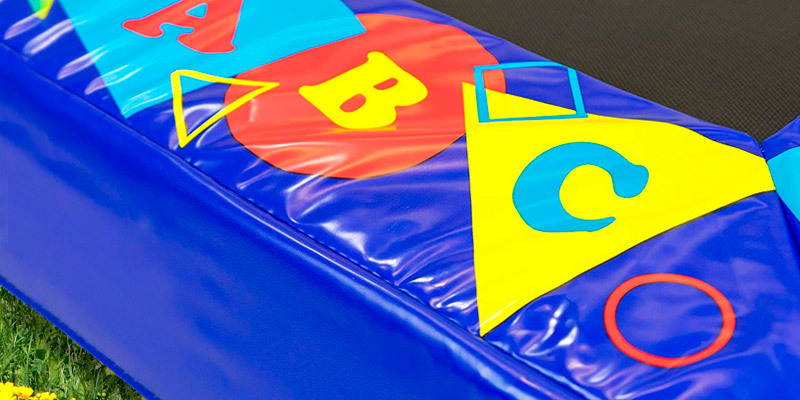 Bouncing is one of the best kids' activities, which combines sports and fun! While jumping, a child experiences the feeling of flight, which contributes to the development of coordination, balance, stamina, and body muscles. It's worth mentioning that bouncing is also a great way to burn a child's excess energy at any time. Parents of overly active children will surely appreciate having a trampoline at home! We also advise you to look through this jump ropes review and pick one to complement your trainings and/or just look after your health. Trampolines can vary in shapes and sizes and can be made of different materials. Nevertheless, there are several important aspects to consider when choosing a trampoline for your child. First of all, you should pay attention to the safety of each item. Safe trampolines are equipped with a net or a handlebar which doesn't let children fall off. Usually, nets are mounted on large trampolines since they are designed for several children. A safety enclosure is manufactured from a durable material which withstands children's weight and is hard to tear. As for handles, they are used for smaller models aimed at 3+ year kids. Handlebars are made mostly of metal with a non-slip soft covering for a firm grip. 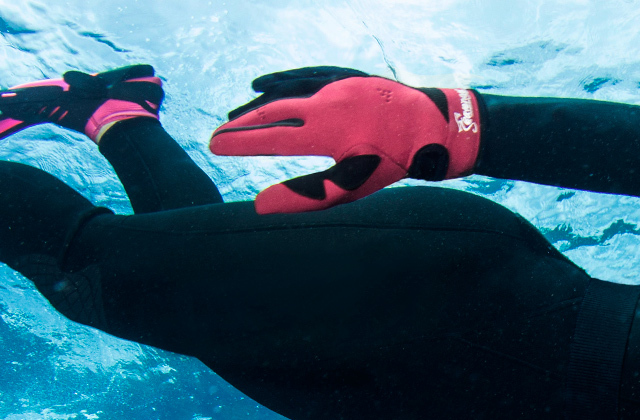 The spring protection is another important feature that provides extra security. 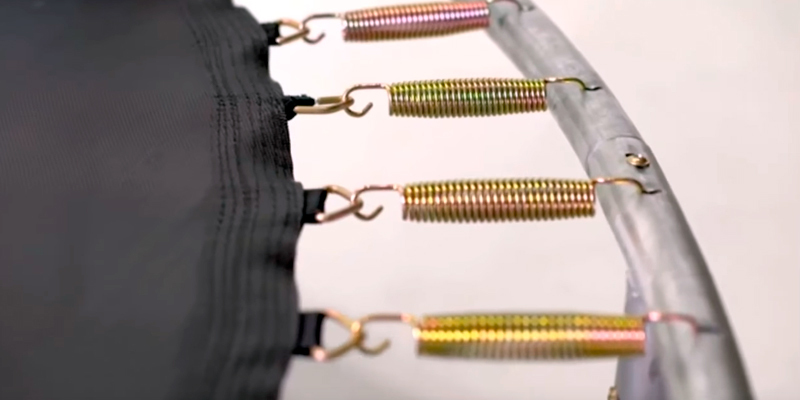 To prevent injury, pad protectors cover up these springs so that kids cannot access them. On buying an up-to-date trampoline, there's very little chance you might encounter with any issue of the kind. 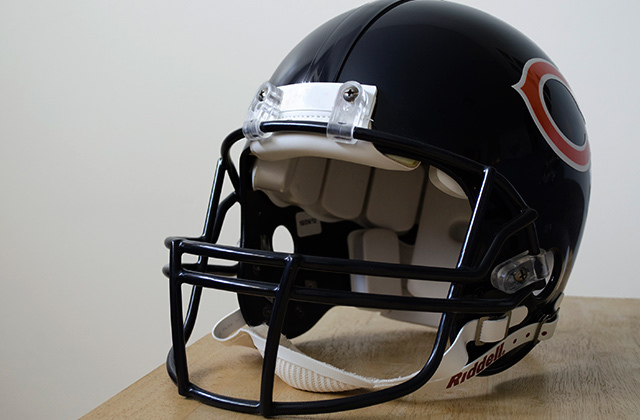 Safety is guaranteed. The next feature you should consider is the design of the trampoline. 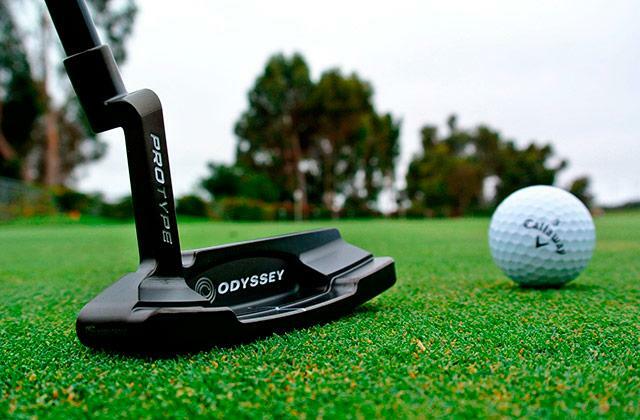 Size, shape, and durability are essential. You should choose a kid's trampoline in accordance with your kid's age. Bigger trampolines are roomy and spacious and will suit growing kids who love jumping together with their friends. Yet, they also take more space so it's vital to measure the area where you plan to set one. 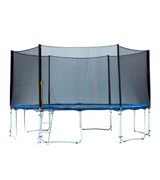 Smaller trampolines are lightweight and compact, they can be used both, indoors and outdoors. But they are all designed for use of one kid and they cannot withstand big weight. Consider the weight of each unit. The bigger its weight is, the more weight it can hold. Cushioning is what affects reliability and jump height. Springs and elastic bands provide jumping ability. 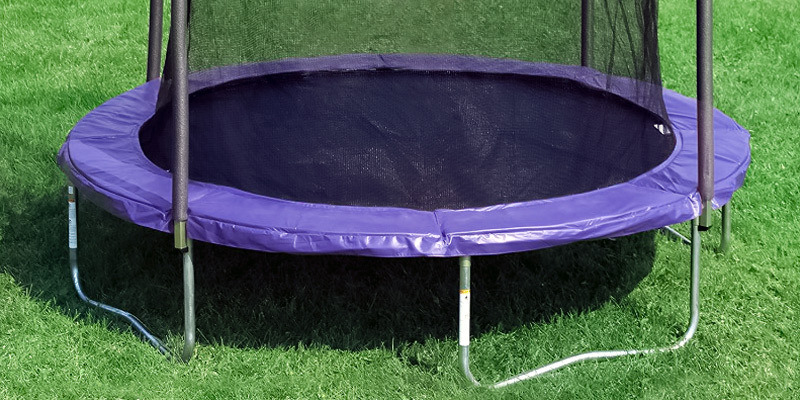 Large trampolines are designed with springs to provide higher jumps. 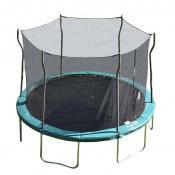 Typically, small trampolines have elastic bands. Therefore, models with elastic bands weigh less than those with springs. The more elements a construction has, the harder it's to be stretched. Durability of trampolines depends on the number of cushioning elements. Thus, 3.2 ft. - 4.4 ft. trampolines should have at least 36 springs, 12 ft. models should contain nearly 80 springs, while the items of 14 ft. and more should be provided with 100 springs (or more). Trampolines have been in our lives for quite a long time. 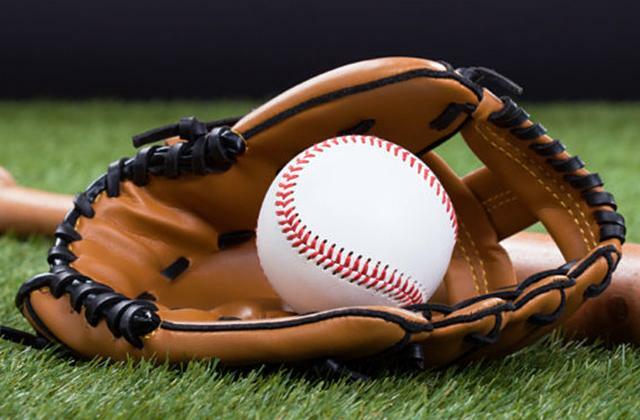 Some people associate them with childhood, while others with sports. Each year more and more special jumping parks and training centers appear in cities, giving people an opportunity to improve their skills and have fun while jumping. That's why investing in a trampoline is actually a very beneficial decision. However, if you still hesitate whether to buy a kid’s trampoline or not, we've gathered some facts that prove that trampolines are actually good for the health and general well-being. The first and probably the most obvious reason why you need to buy a trampoline is that it provides you with a number of physical benefits. When you jump, your blood starts pumping, thus improving the circulation. Such an aerobic workout is extremely good for your heart. With it, no cardio will be required. What is more, jumping exercising is much safer than running, for example, since it lowers the load on your joints. Hence, bouncing on a trampoline will strengthen your bones and your muscles. Plus, jumping is a great way if you need to improve your coordination. While jumping, you have to constantly maintain balance. That’s why practicing on a trampoline will improve your motor skills as well. Agree, a trampoline is a good start to improve your kids' fitness. According to some studies, jumping on a trampoline is also one of the most efficient ways to melt calories. 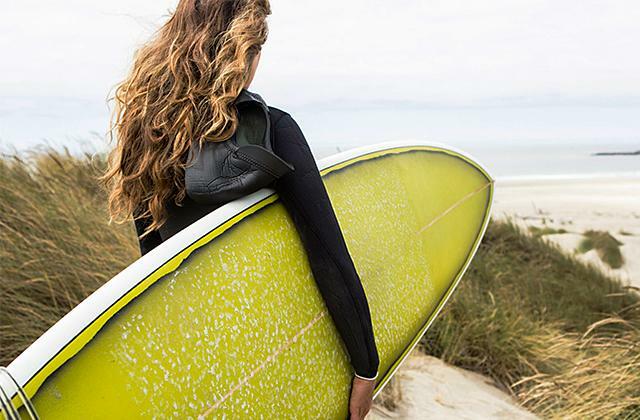 10 minutes of bouncing equals about 30 minutes of running. This fact makes it perfect not only for kids but also for adults. If you want to improve your health, yet constantly struggle with a lack of time, just a few minutes of jumping with your kids daily will contribute to your well-being. Since there are some trampolines that can support quite a big weight, jumping on a trampoline can become an amazing activity for the whole family. Since technologies have become not only a way of learning and working but also of entertainment, both kids and adults tend to spend more time indoors. A trampoline is a great way to bring your whole family outdoors. Trampolines come in different shapes and sizes, so they can fit just anywhere. Placing a trampoline on the patio will encourage your child to stay outdoors longer, which will have a positive impact on their overall health. Needless to say, jumping is fun and this sort of exercising will give kids a good boost of endorphins, making them genuinely happier. In conclusion, we want to say that having a trampoline in your household will help you not only improve your health but also bring a lot of joy. It is one of the easiest ways to stay happy and healthy!